You can light close subjects directly in front of your camcorder or DSLR camera with our LED On-Camera Ring Light with Two-Zone Dimmer. 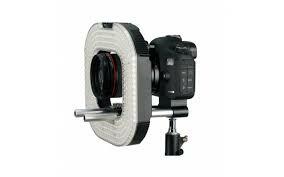 The Ring Light has an opening in the center for your lens when your camera is mounted on the included 15mm baseplate. This placement allows the light to hit your subject head-on, preventing unwanted shadows from appearing. A standard shoe mount adapter is included if you want to use the Ring Light on top of your camera like a normal LED panel. The left and the right sides can be dimmed separately. Use both at the same strength for even illumination, or make one side brighter than the other to create a ‘main and fill light’ look. The Ring Light includes three filter rings to modify the light output. A 3200K tungsten filter to match the color temperature of indoor lighting and two levels of diffusion soften the light removing hard shadows. Quick bit of maths please: required Please check your adding up. Total of 5 + 2 please. Quick bit of maths please: required Please check your adding up. Total of 5 + 6 please. Quick bit of maths please: required Please check your adding up. Total of 3 + 1 please. 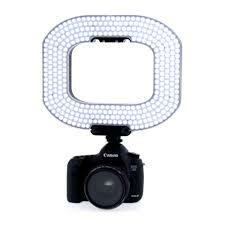 thanks for forwarding on information about the LED Ring Light.